Although simulation technology is relatively new to the field of medicine, the technology has previously been well established in other professions. Flight simulators for pilots and astronauts, military training exercises, management training for business executives, and technical operations for nuclear power plants are all examples of simulation technology currently in use by other professionals. 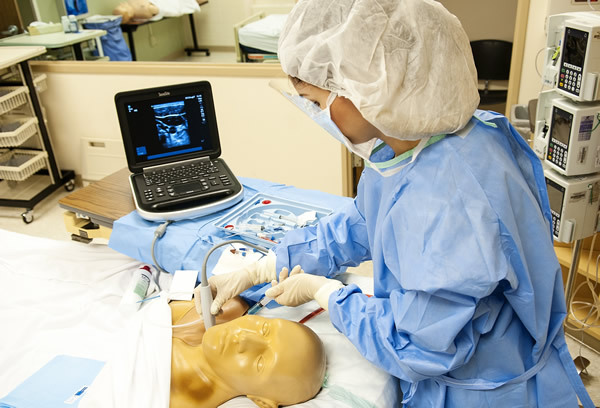 The original Abbott Northwestern procedural simulation lab was started by the internal medicine residency program in 2006 in response to the international trend towards an increasing role of high-fidelity patient simulation to foster experiential learning for our students, residents, and faculty in a safe learning environment. In 2009, the new Abbott Northwestern Center for Clinical Simulation was completed. The new center was founded by the internal medicine residency program, and provides high-fidelity simulation in replica ER and ICU rooms for multi-disciplinary training of code situations, emergency management, and high-risk/low-frequency scenarios. The center's AV system captures scenarios, and facilitates video debriefing following the simulation. Laerdal's new SimMan 3G is the "centerpiece" of the center. Residents are the core training group utilizing the simulation center, and the center is lead by the internal medicine residency faculty with significant contributions from faculty in the departments of critical care, emergency medicine and nursing education. It allows for multi-disciplinary training and interaction between different members of the healthcare team including nursing, pharmacy, physicians, anesthesia, etc., a skill that is critical to an efficient and safe healthcare team. The new Center for Clinical Simulation's procedure lab allows Abbott Northwestern Hospital's faculty and residents to apply state-of-the-art simulation to learning the practice of invasive procedures in a risk-free environment with the ultimate goal being benefit to our patients. Simulation training is an integral part of the required 4-week procedure rotation during your first year of residency. This one-on-one rotation was started in response to the national trend for an increasing role of using high-fidelity "ultrasound-real" patient simulation to foster experiential procedure training in a safe environment, and to increase the volume and quality of procedures our internal medicine residents perform. The center has ultrasound-real thoracentesis, central line, and arterial line simulators. In addition, there is a lumbar puncture simulator, IV simulators, shoulder injection simulator, and knee injection/arthrocentesis simulators. The procedure team's dedicated ultrasound machine is used for all applicable procedures and additional ultrasound training for the resident on the procedures & ultrasound rotation.